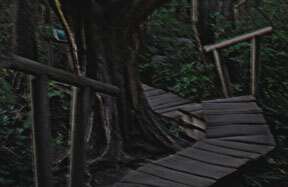 The walkway steps were made of coarse, rickety, irregular shaped, unevenly spaced spruce planks. Hand-bumping knots and dips decorated rustic pole handrails crafted from young, strong saplings. As if in a Harry Potter movie, the winding stairs seemed to lead down and down to a magical, mysterious place. The forest darkened, the evening sun setting orange-purple through the trees. As the forest closed around us we quickened our step. descending anxiously to reach the sea. Though we love and appreciate the beauty nature places before us, one should not think we are serious hikers. We are better called strollers for we have no distance agenda. On the contrary, walking is the way we find nature’s gifts of flowers, vistas and pure mountain streams as well as seeing the sea. The zig-zagging serpentine trail was not as short as anticipated, ruggedly steep and just over half a mile in length. No matter. The magic of Cape Flattery had captured our imaginations leaving caution to fend for herself. 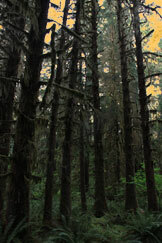 In the fading light, the round protruding roots of the forest trail were tangled and hazardous. We struggled to keep from falling but wasted not a moment, the sweet smell of spruce filling our nostrils. Sounds of Pacific Ocean birds, crashing waves and a fog horn amplified as we grew closer to our destination. Being in the moment, we enthusiastically reached the craggy cliffs just after the sun had dropped below the horizon, while the bluffs still shone with quiet, glow of sunset. Our excitement turned to a kind of frenzy as we struggled to get cameras operating and pointing in all directions at once before the light faded. Light and dark shadows shown mystical over a glistening, rolling green sea of whitecaps pounding against the rocks, tossing waves of spray and mist into a light haze. The white-orange horizon spilled upward into a violet to deep purple sky. The ocean cliffs, surf-pounded for centuries, eroded by winter storms and glacial ice, were ragged and stiffly adorned with cypress and spruce; fjords carved deep into the cliffs by an ever eroding, rolling sea. Cliffs decorated with wildflowers and sea grasses all bending toward the onset of coming fall weather. They abruptly met us, head-on, with all the grandeur nature can muster at the farthest northwestern point on Washington’s Olympic Peninsula, Sheer rock walls housed hundreds of flying seabirds, rising and falling on air currents and sea spray, kiting and swerving, diving, swooping and fishing, performed for us and surely they were having the grandest time imaginable. The trail spilled onto precarious overhanging view platforms. Cameras clicking, we took in the views, jumping one platform to the next on spruce boardwalks and grassy mounds. Rays of light from a bygone sun swept the purple sky above a fog bank sitting at sea level offshore. This, just beyond the island home of the last operating US lighthouse northward on the Pacific coast until one reaches Alaska. The lighthouse shape, the island rooftops and the trees were in silhouette; scores of shorebirds, and sea birds danced in quick flight at days-end. The wind blew hard that night carrying a light evening mist. Our fellow visitors began to fade away up the trail. We continued to study the scene and I commented to a photographer perched outside the rail on the precipice. He answered abruptly, muttering something like, “I am busy.” My eyes searched the, now, almost black stone cliffs for signs of animals and birds. Breaking waves, silver crested, rushed swiftly to the blackened shore. The photographer, whose name we learned later was John, quietly collapsed his tripod and stowed his camera, a sign that he had achieved his goal for the night. We glanced at each other in acknowledgment and clicked our final images. The dogs needed to be lifted from the main platform to the ground. Doing so in the shadow of it, I realized just how dark it had become. No flashlight for us either. We began the trek back. Admonishing herself for wearing barefoot sandals, Kate took the lead following Betsy whose nose bloodhounded to the ground in leadership, wandering back and forth on the curvy trail catching our incoming scent. 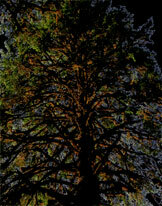 In a few minutes we were enveloped in such darkness that I occasionally flashed a picture to help us get our bearings. This was really dumb. I kept thinking, “Why don’t I have a small flashlight in my pocket?” and began to whistle along to the tune of “Yellow Submarine.” Kate jumped in with her bright and cheery singing voice, “We all live in a yellow submarine!” We sang together as we marched up and up the dark trail, home of a thousand cougars waiting for their chance to attack! I punctuated each line of verse with a deep “Yahoo,” almost a dog bark, to fend off the waiting predators, thinking about the next day’s headlines: “Careless couple attacked by cougars, cocker-spoodle saves the day!” Thanks Betsy. I carried little 12 lb Minna the Shih Tzu, whose scratchy breathing indicated how out of shape she was, my own lungs straining for air as we climbed ever upward. 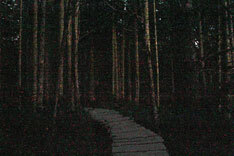 Suddenly up the trail, a piercing red light shown down on us like the laser light of a gun sight. I helloed out loudly and John the photographer called back. He had gotten a light from his car and, though very wary of nearby cougars, he had returned to make certain we arrived back safely from our Cape Flattery adventure. Bill AND Kate: you walk (stroll) gifted lives! Great photos and I’m sure the rise in your heart rates didn’t hurt a bit. Looking forward to seeing you soon! -Ish. Soon-ish. great story. glad everyone is safe! i just read your blog about your adventures on flattery. your stories make my heart pound faster, so i can’t imagine what YOU were feeling! good read, though i am not sure i would have wanted to be in Kate’s shoes! i suggest you ask santa claus for a nice, petite, pocket flashlight. Hi Bill, Was thinking of you and Kate and thought I’d see what you were into. These are some beautiful pictures! I’ll probably never make it back to Alaska again in my lifetime so I’m soaking it all in. How’s the shoulder doing these days?